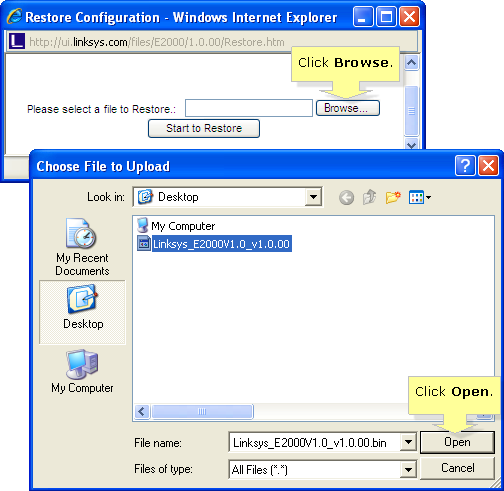 The Backup and Restore configuration feature in a Linksys router allows end users to backup all configurations made to the router. In cases when you need to reset the router to factory default settings, you will be able to restore your previous configuration using the backup configuration file. This will save you time by not going through the process of reconfiguring the router manually. NOTE: For some Linksys router models (E-series and EA series) that use Linksys Connect, you need to access the router’s Advanced settings first in order to perform the Backup and Restore Configuration feature. To learn how to do this, click here. Access the router’s web-based setup page by opening a web browser such as Internet Explorer or Safari. On the Address bar, enter your router’s local IP address then press [Enter]. When the login prompt appears, enter your router’s User name and Password. NOTE: The default local IP Address of Linksys routers is 192.168.1.1 while the default password is “admin” and user name field is left blank. If you have changed the password before and forgot it, you need to reset the device. For instructions on how to reset a Linksys router, click here. Once the web-based setup page appears, select Administration. You will be automatically taken to the Management sub-tab. 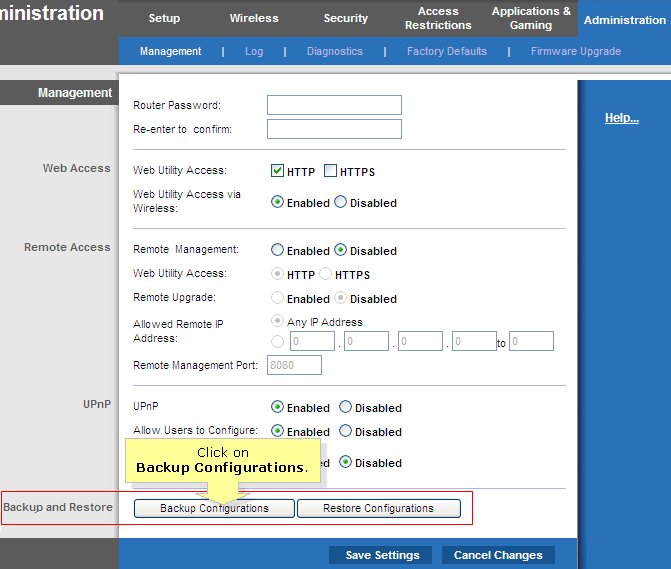 Click on the Backup Configurations button on the Backup and Restore column. NOTE: The Backup and Restore option is located on the bottom part of the Management page. A new window will prompt you to save the configuration file (with .bin file extension). Click Save on the File Download window and select the location to save the configuration file then click Save. NOTE: In this example, we used the Linksys E2000 router. The filename of the configuration file may vary depending on the router being used. From the Management page, click on the Backup and Restore column. A new window will appear for you to select the configuration (.bin) file to be restored. Click Browse to locate the file. Once you’ve located the file, select it and click Open. NOTE: The configuration (.bin) file will be loaded on the Restore Configuration window. Click on Start to Restore to begin restoring the configurations. NOTE: If you encounter problems when restoring your configuration, perform a firmware upgrade. This will update the firmware on your router which will fix bug issues and possible errors. For instructions on how to upgrade your router’s firmware to the latest version, click here. After the upgrade, perform the restore configuration steps again.